He is crowning an Emperor, who kneels before him, two Cardinals attending, one of whom is ludicrously personated by Death. In the background are bishops, &c. Death embraces the Pope with one hand, and with the other leans on a crutch. 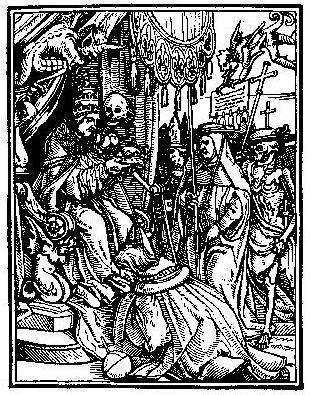 Two grotesque Devils are introduced into the cut, one of whom hovers over the Pope; the other, in the air, holds a diploma, to which several seals are appended.